Use Check-in to geo-tag your client visits instantly. Done with your client visit? Yay! Call your sales manager and inform him/her that you are done with the meeting. 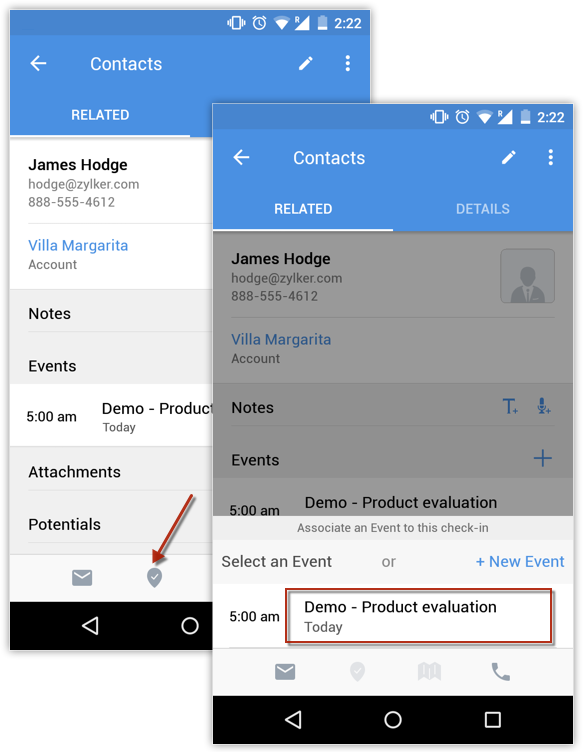 Create/update the event in your Zoho CRM and associate it to the lead or contact. Keep a note of all the visits that you have made in the past to report to your manager. For a sales rep who is always on the move trying to visit as many clients as possible in a day, this could be very daunting. Check-in comes to your rescue. It's a great feature in the Zoho CRM mobile app with which sales managers and sales reps can manage their work-related visits easily. When a sales rep is done with a client visit, he/she can check-in and geo-tag the visit right away in a single click. It not only makes a record of who you meet, but it also keeps your colleagues informed about what's happening. The check-in is recorded as a note to the respective lead/contact. Each check-in can be associated to an existing event for the record or a new event can be created and associated. This tells the sales manager that the rep has visited the client. What's more, the sales manager can even create reports based on the check-ins for a location, a particular sales rep and more to draw inferences. To know more about the check-in feature, refer to Associate check-in to an event.